The oils in this select collection will provide ongoing support for your home, health, and body. EnJoy the relaxing benefits of lavender and Peace & Calming, the cleansing power of Thieves and Purification, the comforting touch of Valor and PanAway, the uplifting properties of the newly added Joy™ essential oil blend, and much more. was created so that anyone could immediately use and appreciate the benefits of our most popular therapeutic-grade essential oils and blends. The single oils may be used as dietary supplements. All of these oils may be diffused, applied on feet, added to the Bath and Shower Gel Base or Epsom salts to be used in bathwater, applied topically, or used for body massage. Comes with a Missing Link cassette. Contains: Three Single Oils (5ml bottles): Lavender, Peppermint & Lemon. Four Blends (5ml bottles): Joy, PanAway, Peace & Calming and Purification. LAVENDER - 15 ML (Lavandula angustifolia) has a fresh, sweet, floral, herbaceous aroma that is soothing and refreshing. Because it is the most versatile of all essential oils, no home should be without it. It is great for winding down before bedtime, yet has balancing properties that make it just as beneficial for boosting stamina and energy. * Therapeutic-grade lavender is highly regarded for skin and beauty. It may be used to cleanse cuts, bruises, and skin irritations. The French scientist Rene? Gattefosse? was the first to discover these properties when he severely burned his hands in a laboratory explosion. Using lavender oil, he noticed a remarkable healing soon afterwards. Lavender has an approximate ORAC of 3,669 (TE/L). TE/L is expressed as micromole Trolox equivalent per liter. See us for Young Living catalogs to order. 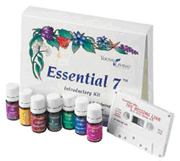 To be able to order Essential Oils for yourself at wholesale prices, call 1-800-371-2928. Distributor sign-up fee is $50. Sign-up fee includes a fabulous black durable carrying bag, plus 2 samples of essential oils and samples of the skin care, 5 full-color catalogs to share with friends and family, several CDs for training, and price lists. Use member# 611140 when signing up.